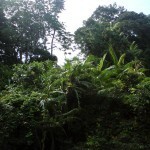 It took most of a day to get from Kuala Lumpur to the jungle. Not knowing anything definite about my Dad’s time in Malaysia, I knew at least that he had been here once and figured this place at least must be the least changed since he was here nearly 60 years ago. Taman Negara is the massive national park over 4000 km2 at the heart of Malaysia. It was 2 bus rides. Palm tree plantations line the roads all over Malaysia. 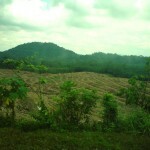 Is this palm oil production? They didn’t look… happy trees. Planted in uniform straight lines, no plants in between. They looked on military attention, never allowed to stand at ease. Something about them reminded me of the concentration camps. Occasionally we went past a bleak muddy field where they’d been felled – straight lines of tree stumps amongst the churned earth. 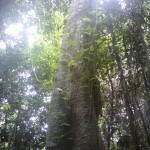 The trees in Taman Negara in contrast felt utterly untamed, and more than wild, almost dangerous in its power and careless of humanity, a minor irrelevancy beside it. The last leg of the journey to the heart of the jungle was by boat upriver. 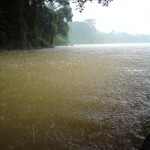 As the boat set off a torrential rainforest rainfall crashed down, huge and exciting. The weather cleared up quickly and returned to its previous strong sunny heat as we continued up the wide brown river surrounded by towering beautiful green. So many trees. 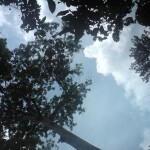 They pulled me down to the earth, grounding me after my jetlag and confusion in Kuala Lumpur. 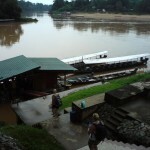 The boat goes to the park headquarters and the village of Kuala Tahan where I found somewhere to stay, my own little chalet in a pretty little family-run holiday place. The next day I went for a walk on one of the well-marked paths through the park. 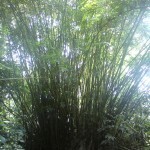 Towering bamboo, prehistoric looking trees, vines. There is all sorts of wildlife here – elephants, tigers and leopards – but you never see them. 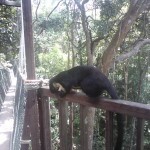 I saw a squirrel / monkey thing, a small pretty brown snake, huge ants and a tapir (a cross between a cow and an elephant, very cute). I went the Canopy Walkway amongst the tree tops and remembered too late that I don’t like heights, but managed it and felt like Tarzan for a moment which was cool. 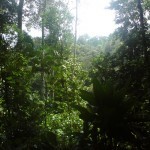 I climbed up a hill – Bukit Indah – and took in the enormity of the forest from there when the rain came down again. ‘Wet’ is the operative word, either drenched in sweat instantly or swamped with rain, which doesn’t do much to clear or cool the air. 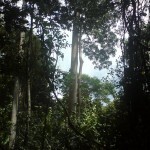 It’s known as the green lungs of Malaysia and here I felt it, the massive untamed forest breathing and working as one. The organic whole of it integrated, mist drifting through, water and carbon dioxide moving up. This is what the world would be like if you just let it be. Forest. The quiet, almighty power of trees – with plants, animals, birds and insects – supporting each other, and the irrelevancy of humanity beside it. ‘Impenetrable’ is what the books say. To humans. You can easily imagine the footpaths created by the park overgrown quickly if left unattended for just a short while. Did my Dad fight here? I feel sorry for anyone living or fighting in this jungle, the heat and constant dampness. It was overwhelming. The rain started to increase, not a mere shower, thunder and lightening, and already soaked through by the warm rain I started to run along the path back to the park headquarters. Along the path I met a man who touched me – Goddammit! I ran like hell then! Suddenly I felt the fear of being alone on the other side of the world and my vulnerability. I reported it to the park and police. I think he was one of the local tribal people, the Orang Asli who live there, which was a shame but I guess every people has it’s quota of arseholes! I don’t imagine its much fun for the tribal people these days, especially in this part with loads of westerners traipsing through. I had thought of going on one of the tours to visit an Orang Asli village but changed my mind as I don’t believe in gawping at people, and from what I’d read the people don’t benefit much from those tours. But I was shaken up as I generally feel safe in natural environments, much more so than cities. Anyway tomorrow it was time to go. I had get from Taman Negara to Penang Airport in the north of the country for an early flight the next day to Hong Kong. This was a good day’s journey, involving the boat ride back downriver, 2 buses and a taxi, still it looked do-able. It started to go wrong when I got to Jerantut where I was due to get the bus that would take me most of the way to Butterworth near Penang Airport. Here I was told that this 6pm bus didn’t get in to Butterworth at 11pm as I thought but at 4am. This cut it rather fine to check in for a 6am flight, Butterworth being 45mins drive from the airport… Ok. There was no other bus or means to get there. I asked rather desperately how much a taxi all the way would be (a journey of over 400km). Apart from being hugely overpriced, for some inexplicable reason the taxi drivers assured me they’d be no quicker than the bus and I’d be better off getting the bus. I accepted this as I had no other choice and tried to become philosophical. At 6.35pm the bus due at 6pm turned up. The driver insisted that we will still get into Butterworth at 4am, which seemed conceivable as there were a lot of hours to catch it up. The bus was comfortable and safe and once we were off I started to relax again and slept for about an hour. When I woke up at 8pm it was beginning to go dark and my mind started to whirr… What will happen if I do miss this flight? When and how much will be the next one? How would I let the transport and hotel that I’d booked in HK know now I’m on a bus with no wi-fi or phone numbers (all tidily stored in my stuff in the bus’s trunk)? Have I got enough Malaysian ringits left to give the taxi driver at Butterworth the ‘incentive’ they need to get me to the airport speedily? Is it 45 mins or an hour to the airport? What if it’s longer? What if this bus is late? etc. Out of desperatation and a need to feel connected I texted my sister in UK who is very good at this sort of thing and asked her to check out a few of these things: What time I can check in at the airport at the latest? Can she let them know I’m on the way? (‘no’) Later flights if necessary? Hotels at Penang airport if I need one? She most wonderfully did. I spent the rest of the night fitfully sleeping, eating the horrible junk food I’d bought in Jerantut, trying to read in the dark bus with my head torch on, and trying to avoid slipping into a dark void somewhere in the middle of the darkness that was preying upon me. At 3.30am I roused myself from semi-delirium for the crucial next phase, arrival at Butterworth. The bus arrived early at 3.45am! I was immediately jumped on by a taxi driver: ‘Taxi?’ Standard and usually very annoying practice, however in this case I said yes. How much? I asked. He hesitated: ‘60 ringits.’ Fine, I’ve got that. This is probably a rip-off price, but I don’t care. ‘Okay, but I need to get there really quickly.’ The taxi driver takes it on immediately and bustles me over to his cab. I sling my case on the back seat and while he drives like a complete lunatic, I reorganise my bags putting all my sharp and liquid things into the case, getting heavy books out and putting them in my hand luggage (I know the case is close to 20kg). At 4.08am we arrived at Penang Airport!! Hooray! I have no idea how he made a 45min journey take 23mins except it must have been illegal but in the circumstances I could only be only grateful. I paid him and checked in. Used the loo and even had enough time and ringits left for a cup of coffee at Macdonalds. Not normally my first choice but in the circumstances it was all I needed. Everyone else for the flight looked sleepy but at least clean and well-dressed, unlike myself. I felt sorry for the poor woman who had to sit next to me, crumpled and sweaty in the same clothes from all day yesterday and overnight, probably snoring through the whole flight. Ah well. At 9.45am we landed as per schedule at Hong Kong. Hurrah!